Now that the Federal Reserve-stimulated asset bubble has burst in the housing markets, and the subsequent follow-on government attempts to fix a government-created economic crisis are failing (see cash for clunkers and the market-distorting "first time homebuyer credit"), it's time to assess your current situation and decide whether or not to walk away from your mortgage. The government, by changing the rules and allowing the "too big to fail" banks and their executives to escape the consequences of their actions, and ultimately causing the "too big to fail" banks to get bigger, has set the stage for the ultimate moral hazard. What does that mean? By changing the rules and bailing out the multi-million dollar bonus executives, they have shown us that the rules don't apply across the board. If your gigantic "systemically important" corporation gives enough money to Barney Frank and the rest of Congress, you get your bonus even if you've succeeded in destroying your company. This means that those of us on main street, who were caught up in the Federal Reserve's asset bubble creation (aka, the housing bubble), are stuck holding the bag while the politicians and the bank CEOs laugh all the way to the bank - literally. The housing market in Michigan won't get back to it's pre-housing bubble days until at least 2023, according to estimates. This means that chances are pretty high that your house is worth far less than you owe, assuming you got a mortgage in the last ten years (and didn't cash out with a home equity loan). In fact, chances are your house is worth 30%+ less than it was just three years ago. The solution? Walk away from your mortgage. There's a handy calculator that will tell you if it is worth it to walk away. You can try out the calculator here. I can hear it already. Moral obligation, doing the right thing, living up to promises, etc. Yes, you might have been right five years ago. Now, the rules changed in favor of the oligarchy. That means that all bets are off. We, the taxpayers, are stuck with an exponentially-growing national debt. The federal government continues to take on bad debt from the private sector. We get saddled with bad debt; the bank get to keep their bonuses and get even bigger. The housing market isn't coming back any time soon. In fact, it's going to continue to get worse as we are hit with a deflationary depression. Japan did exactly what the US government is doing now. They've been stuck in a deflationary spiral for over ten years. Fix your family budget. You alone will look out for yourself. Don't expect the politicians or CEOs to do anything that's in your best interest. Consider walking away from your mortgage. It's suddenly in vogue to rent again. You can rent a house nicer and bigger than the one you have for less money. Move all of your checking/savings/investment accounts away from the big national banks. Find a local credit union. Credit unions didn't participate in the housing bubble run up. They don't screw over their customers with outrageous fees. They are non-profit institutions that return profits back to members. Pay off unsecured credit card debt as fast as you can. Cut up the cards. Pay for everything else with cash (or your credit union debit card). Stockpile CASH. In a deflationary spiral, cash is king. Instead of (government-created) inflation eating away at the value of your money, deflation increases the value of your cash. If you lose your job, stop paying on debt immediately. Build up savings, if you can. Only worry about feeding your family and keeping a roof over your heads. Foreclosure can take more than a year as the banks are overwhelmed. This isn't capitalism any more folks. This is oligarchy. WARNING: If you are considering walking away from your mortgage, it is extremely important that you work with an attorney experienced in foreclosure and short sales. Update: See my latest post on this issue: Housing and Taxes. The revenue collected from Michigan’s General Fund and School Aid Fund earmarked taxes totaled $1.3 billion in May, which was down 13.4% from last year’s level. This marked the fourth consecutive month that tax collections have declined in excess of 10.0%. While collections for almost all of the major taxes experienced declines in May from their year-ago levels, the most significant declines were experienced by the sales, use, and income taxes. Compared with the Senate Fiscal Agency’s monthly breakdown of the revised consensus estimates for FY 2008-09, May collections fell below the monthly estimate by $62.0 million and this shortfall was due primarily to weaker-than-expected sales and use tax collections. When the Senate Fiscal Agency met in mid-May, they estimated the revenues for the remainder of the fiscal year. Despite the fact that they updated their estimates at that time, actual revenues for May declined by $62 million. In other words, in the matter of a few weeks, their estimates were already off. The budget is deteriorating that quickly. Sales tax revenue totaled $406.6 million in May, which was down a sharp 22.2% from the year-ago level. A consistent historical monthly series for the sales tax is available back to FY 1984-85 and the decline in May marks the largest percentage decline in monthly sales tax collections during this 24-year period. Tobacco tax revenue totaled $84.0 million in May, which was down 5.9% from last year’s level. Most of this decline is likely due to the large increase in the Federal tobacco tax that went into effect on April 1. The Federal tax increase is having a negative impact on Michigan’s $2-per-pack cigarette tax because it boosted the price of cigarettes and therefore is having a negative impact on cigarette sales and Michigan’s tax receipts. That last quote is vitally important. It perfectly exemplifies the power of taxation. It's common sense, but the politicians in Lansing don't seem to get it. The more you tax something, the less of that "something" you're going to get. Clearly, the more cigarettes are taxed, the fewer cigarettes that will be sold. The same goes for businesses. The more you tax businesses, the fewer businesses there will be, and hence the fewer jobs there will be. Gosh, it's pretty simple, but our tax-hiking pals in Lansing and elsewhere don't seem to get it. Finally, the $406 million of sales tax revenue in May was the lowest monthly level of sales tax collection I could find, going back at least until 2005. Michigan is hurting, folks, and it's only going to get worse, as exemplified by the state's skyrocketing 14.1% unemployment rate. Read a little about how California's government is collapsing because of that state's inability to enact any rational level of reform: California Collapsing. I found an interesting chart, courtesy of city-data.com, showing the median home price in Grand Rapids, as well as the number of homes sold on a quarterly basis. Clearly things are bad and getting worse. Median home prices have dropped almost in half since 2004. Incredible! 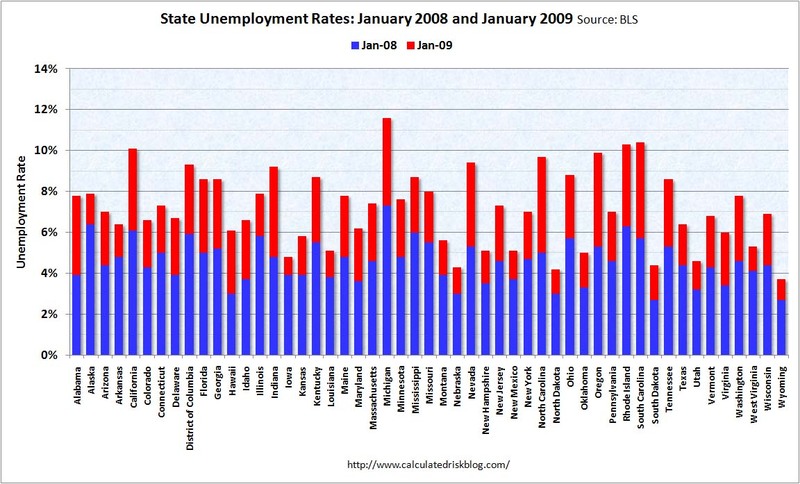 Oh, and remember our post about how the stimulus won't do a damn thing? Below is the Federal Government's chart, formulated back in January, which attempted to scare people into passing the gigantic wasteful bloated stimulus plan. They wanted to show how bad things would get without the stimulus and how much better things would be if the stimulus did pass. Guess what. Things are much worse than either prediction. The red dots are actual unemployment since January. Just another reason not to believe any of the bilge coming out of Washington when it comes to economics. An important article appeared in the Grand Rapids Press last week that highlights several issues regarding the failed Silver Line bus system and the false claims of economic development that are touted by the Silver Line's supporters. The Grand Valley Metro Council (very much pro-Silver Line) won $400,000 in federal grants to clean up several abandoned sites along Division avenue, in the hopes that this will attract more development. You can almost hear how this would have been announced if the Silver Line had passed. It would have been touted as the first in a series of positive developments because of the Silver Line. Of course, the Silver Line had nothing to do with this grant award, but it underlines the claims that these sorts of transportation projects somehow spur development. However, as this news item shows, the development is largely spurred by government subsidy, not the appearance of a fancy silver-colored bus line. The Rapid supporters confuse correlation with causation. It goes against logic that replacing the current buses with buses that are painted silver will someone convince people and business to move to Division Avenue. As we have previously pointed out, the development in Portland around mass transit, as the pro-Rapid supporters love to point to, only occurred after government subsidies were enacted. The development did not occur due to the mass transit system. This is the heart of the pro-Silver Line argument; that the Silver Line "would have" spurred several dollars' worth of development for each dollar spent. This is simply not the case. The only evidence the Rapid points to in support of their argument is a thinly-documented three page article, as we pointed out here. However, this Press article also points out that they haven't given up on the Silver Line boondoggle. The article states, "Although [The Rapid] expects the Silver Line route eventually to win the voters' blessing, plenty of other properties could be helped in the meantime . . ." Clearly they aren't done with trying to sell this mess to the voters. Based on the negative Silver Line feedback both in the Press and on other online sources, it seems unlikely that they can salvage this project without significant changes. Even the pro-transit people weren't convinced about the need for the Silver Line. As you can see, Walker, Wyoming, Kentwood, and Grandville all soundly rejected the tax increase request and even Grand Rapids was closer than expected. The pro-Silver Line people are predictably dour. The comments of Peter Varga, executive director of the ITP (Rapid), sum up their attitude perfectly. He said it was rejected simply because voters didn't understand the request. Right. Voters heard from this blog as well as other groups who exposed the bad plan of the Silver Line. The Rapid folks tried their hardest to limit the information available on this request, but active citizens exposed the Rapid and let voters know the facts. This web site alone received thousands of visits from people searching for more information. In summary, bravo for the voters of the four cities who rejected this request. Make no mistake, they will be back, asking for more. Their next request will be for more than $100 million for an even more inefficient light rail line. The supporters of the proposed $70 million Silver Line bus system in Grand Rapids tout it as a "Bus Rapid Transit" line. The proposed route of the Silver Line is up Division from 60th Street, a jog around the hospitals around Michigan street, and back to the Rapid station. The total route, according to Rapid, is 9.8 miles. It will take 35 minutes for the new "Silver Line" to travel this route. An important note here is that, as we've previously pointed out, Division will be turned into an effective two lane road (one lane each way) so that these Silver Line buses can have their own dedicated lanes. This supposedly will speed these buses up because they won't have to share these lanes with regular cars. But wait, the Rapid already has a bus, route #1, that travels from the Clyde Park Meijer, down to 68th Street, up Division, and around to the Rapid station. The total distance for the current buses on this route is 12 miles, according to Google Maps. In addition, according to the Rapid's web site, the buses on this route take about 33 minutes. Let's do the math. The Silver Line is supposed to take 35 minutes to travel 9.8 miles, with dedicated lanes on Division. The current #1 bus, traveling 12 miles, takes 33 minutes, sharing the lanes like every other vehicle on the road. The Silver Line factors out to be traveling at around 16.8 miles per hour. The current bus factors out to 20.57 miles per hour. Huh? How do they call this Bus Rapid Transit? It's Bus Slow Transit. It's slower than the regular buses that take the same route now! Don't forget that these dedicated Silver Line lanes on Division will squeeze all current traffic on Division down to one lane in each direction. Traffic jam, anyone? Be sure to cast your vote on this idea on Tuesday, May 5th, if you live in Grand Rapids, East Grand Rapids, Wyoming, Walker, Kentwood, or Grandville. Grand Rapids Pundit has received one of the pro-Silver Line post cards in the mail, as I'm sure many residents of the ITP service district have (Grand Rapids, East Grand Rapids, Walker, Wyoming, Kentwood, and Grandville). This post card, which you can view here, exemplifies the continued contempt that the ITP/Rapid has for the taxpayers. The post card says virtually nothing about the reason for the tax increase. In fact, they bank on voters knowing as little as possible about this tax increase. The more voters know, the more likely it is that they will vote no. That's it? Yes, that's it. As previously stated, they don't want you to understand all the details. What is the Silver Line really? As we've previously reported, it is a Bus Rapid Transit line that will dedicate one lane each way on Division Avenue from 60th street to the Rapid Station for use only by these new buses. This means that Division will be limited to one lane each way for regular vehicular traffic during peak traffic hours (rush hour). You heard that right. Division will turn into a traffic nightmare, likely pushing traffic to side streets to find better ways to get where they are going. They say that this new "traffic priority" system will allow for these buses to travel much faster than current buses (which already travel the same exact route as the proposed Silver Line). How much faster? Well, we don't really see any improvement. The Silver Line's route would be 9.8 miles long and would take the new buses 36 minutes to travel. Huh? Yes, that's right, 16 miles per hour. We don't honestly understand how they can call this a Bus Rapid Transit line. But wait, it gets better! This whole project is a $70 million tax increase - all so that they can duplicate the bus route they already have. No kidding: they already have a bus that travels this route. There's no reason to raise taxes by $70 million just to duplicate what's already there. If you are a resident of East Grand Rapids, Grandville, or Walker, you will see no benefit from this line at all. If you are in Kentwood or Wyoming and happen to live near Division street, you might be able to use this new line conveniently, but as said before, there already is a bus line on this route. Basically, very few residents of any of the six ITP cities will see any benefit, yet will be expected to pay for it. In the same vein as the near-informationless post card, the Rapid's pro-Silver Line web site lists one source for their claim that the "investment" in the Silver Line will create jobs and produce a return on investment through new development. They reference an article named "Bus Rapid Transit: A Powerful Real Estate Development Tool" by William Kaplowitz. They don't provide a link to this article, nor the text of it. So we did a simple Google search and came up with the text of the article. Read it for yourself here. The article makes a couple of simple, poorly-documented claims about development, and that's it. That's what they use to try and get residents to raise their own taxes by $70 million. What they don't discuss is that most of the time this "new" development was already happening or happened only because government created tax incentives to do so. In other words, they confuse correlation with causation. Just because development occurred around same time as the bus system's implementation, it doesn't mean that the buses caused the development. For example: there already is a lot of development going on along Division. It is likely that the Silver Line people would say that the Silver Line caused that development if they try and tout the "benefits." But once again, since there already is a bus line along Division, it's hard to understand how new buses would suddenly spring up more development. But this is how the ITP/Rapid works. They don't release their budgets. They don't make true ridership numbers (by route, etc.) easily available. They don't release the true operational statistics of their system. They don't release the minutes of their board meetings, as the City of Grand Rapids does. They operate as though they don't need to be accountable. But they're a publicly-funded body and they need to operate transparently. The Rapid operates secretively so that you don't understand how they operate. It's all part of their contempt for taxpayers and efficient operations. Don't forget for vote on Tuesday, May 5th if you live in Grand Rapids, East Grand Rapids, Wyoming, Kentwood, Walker, or Grandville. General Motors Corp. capped a dismal 2008 with a $9.6 billion loss in the fourth quarter, brining its loss for the year to $30.9 billion. GM is now subsisting on $13.4 billion in government bailout loans... [and is asking for] as much as $16.4 billion more... GM also said it needs $7.5 billion in loans from the Energy Department to build more fuel-efficient vehicles. GM's auditors must make a decision on the company's "going concern" status by the end of March. GM also reported a major reversal in the health of its pension funds. It said its U.S. pension commitments for hourly and salaried retirees are underfunded by $12.4 billion... In early 2008, the company said the pensions were overfunded by $18.8 billion. In addition, the earning report revealed a profound deterioration of GM's once-booming operations outside the US. It reported a fourth-quarter loss of $1.9 billion in Europe, $917 million in Asia, and $181 million in Latin America. Wow. Just wow. General Motors is a dead company. GM's net worth went from negative $39 billion at the end of 2007 to negative $86 billion at the end of 2008. GM sold 8.144 million cars worldwide in 2008, meaning that they lost $2333 per vehicle. As the article points out, GM now wants an additional $23.9 billion in loans. Those loans come from us, the US taxpayers. Folks, the math doesn't work. There is no way GM can pay off these loans and build net worth into positive teritory. GM is a dead company that is being propped up with absolutely no chance of recovery. It's like Weekend at Bernie's, except this is the real-life destruction of wealth, with the blessing and aid of the politicians in Washington. We, the taxpayers, are getting absolutely screwed. We can debate the reasons for the death of GM, but the fact is that the continued life support of General Motors is irresponsible, destructive, and dangerous. Add the bailouts of GM and Chrysler ($17+ billion, so far) to the bailouts of banks ($750 billion), AIG ($150 billion), Fannie Mae and Freddie Mac ($400 billion), and we have the looting of the Treasury going on right before our eyes. The bill, so far, is already over $1.3 trillion. That's just in the last five months. Yet, the looting continues. Change we can believe in, right? By the way, this isn't a partisan issue. Both parties are destroying America. ...And it's probably too late to do anything about it. Are you prepared? Change we can believe in? Last night's press conference by President Obama was hardly a departure from the typical George Bush-style fear-mongering. You can sum his speech up like this: "Pass the stimulus, or else the universe will collapse!!! Gravity will fail! The sun will implode! Think of the CHILDREN!!" The REAL natinal debt - including all unfunded future mandates. The math just doesn't work. Yes, it currently says $58 trillion. This post will show how the proposed $825 billion "stimulus" package will do absolutely nothing to help the economy and will only serve to make the existing economic problems worse. "But wait! How could that be?" you ask yourself. All the politicians and talking heads on TV are saying that it will boost the economy and create jobs! I'll let you in on a dirty little secret - most politicians and talking heads don't have a basic understanding of economics. I'll explain it to you as simply as I can so that you can be better informed than 99% of politicians and talking heads. First: The proposed stimulus has a price tag of $825 billion. You can view the proposed stimulus by clicking here. Let's reduce that number, because it includes $275 billion in tax cuts. Government accounting is completely different from real world accounting, so they include a tax cut in the "cost" of budget bills. This simply means that we get to keep an additional $275 billion of our own dollars. The result? The actual new spending by the government is $550 billion. So, we've already reduced the "stimulus" spending by a third. Second: Where does this new spending money come from? The US government raises money by selling Treasury bonds. These bonds are sold to the general public. It's basically the same as taking out a loan to increase your personal spending. These bonds require the government to pay interest to those who purchased the bonds. Therefore, the money the government will spend on the stimulus will in fact be money that it borrows from other people. So in effect, for every $1 that the government spends on this stimulus, $1 was diverted from other investments. In other words, no new money or growth is being produced. It's the same as borrowing a dollar from your neighbor and lending it to another neighbor. Nothing was added to the economy and no new investments were created. The money being spent on the stimulus is money that would have been invested someplace else anyways. Third: Instead of that "stimulus" money being spent by private sector employers, it will be spent by politicians and bureaucrats. The transfer of wealth from potential private sector investments to the Federal Government will do absolutely nothing to create new jobs. It's simply a transfer of money. In fact, it will likely result in fewer jobs because once bureaucrats and politicians gets their hands on the money, it will be severely whittled down by bureaucratic wrangling and government ineptitude. Bottom line - the stimulus will do absolutely nothing to "stimulate" the economy. Oh, but there's more. That $550 billion that's being borrowed to increase federal spending carries with it a bill for interest that the federal government must pay from either the general budget or by borrowing more money! Guess what! The federal government already spent $412 billion on interest on the national debt, just last year! This new spending will add approximately $20 billion to that amount, each year. This is a losing game folks. It's no different than taking out a loan to pay the interest on another loan. It will eventually collapse. It's the biggest Ponzi scheme in the history of the planet. It's piling borrowing on borrowing while adding nothing net new to the economy. Excessive borrowing and leverage got the world into this economic crunch - more borrowing will not make it better. US and UK banks are insolvent. From Bloomberg: "U.S. banking system is effectively insolvent"
The FDIC, which "insures" US bank deposits, has a insurance fund that with $34 billion in it. The FDIC "insures" $4.6 trillion in deposits. If just one big bank fails, FDIC is bankrupt. Fractional reserve banking is coming home to roost. What Happens When You Take Away the Corn? There's an old parable about getting hooked on government handouts. I had heard this years ago, but it just popped in my mind again today. I searched the Internet and found one version of it. A chemistry professor at a large college had some exchange students in the class. One day while the class was in the lab the Professor noticed one young man (exchange student) who kept rubbing his back, and stretching as if his back hurt. The professor asked the young man what was the matter. The student told him he had a bullet lodged in his back. He had been shot while fighting communists in his native country who were trying to overthrow his country's government and install a new communist government. In the midst of his story he looked at the professor and asked a strange question. He asked, 'Do you know how to catch wild pigs?' The professor thought it was a joke and asked for the punch line. The young man said this was no joke. 'You catch wild pigs by finding a suitable place in the woods and putting corn on the ground. The pigs find it and begin to come every day to eat the free corn. When they are used to coming every day, you put a fence down one side of the place where they are used to coming. When they get used to the fence, they begin to eat the corn again and you put up another side of the fence. They get used to that and start to eat again. The young man then told the professor that is exactly what he sees happening to America. The government keeps pushing us toward socialism and keeps spreading the free corn out in the form of programs such as supplemental income, tax credit for unearned income, tobacco subsidies, dairy subsidies, payments not to plant crops (CRP), welfare, medicine, drugs, etc. While we continually lose our freedoms -- just a little at a time. It's a good story by itself, explaining how government breeds dependence. But another thought popped into my mind as I thought about this story. What happens we you take away the corn? We're in the midst of the largest expansion of federal spending in the history of this nation, with over $8.5 trillion of federal government outlays and guarantees, just in the last four months. We have a national debt that has doubled under the Bush administration, to over $10.5 trillion. We have future unfunded liabilities, just at the federal level, of over $40 trillion. We have state and local governments that put taxpayers on the hook with unsustainable defined benefit pension plans that are just now beginning to collapse. The point is this: The American people have been fattened up by corn over the last several decades, with an acceleration over the last two decades of Federal Reserve-induced malinvestment orgies. First in technology, then in real estate. These malinvestment orgies led to expanded government spending and government promises, making more and more people dependent on government money (corn), one way or another. However, the math doesn't work in the long term. Something has to, and will, give. We are seeing the first stages in a potential catastrophic collapse. We are in the midst of deflation. The Federal Reserve and politicians in Washington will do anything they can to prevent deflation. So they have cranked up the printing presses and are expanding the money supply at a truly unprecedented rate. We have collapsing banks, collapsing industry, a collapsing economy, a collapse in debt, and a collapse in consumption. Eventually, people (and, more importantly, foreign governments) will stop buying US Government bonds as they see that annual deficits of $2 trillion are unsustainable. Then what? "Stimulus" plans will fail. Hoover/FDR stimulus plans in the 1930s only extended the length and depth of the depression. The Bush/Obama stimulus plans will do the same. Folks, the government corn will run out when we all realize that nothing can be done to stop the natural correction of the economy.